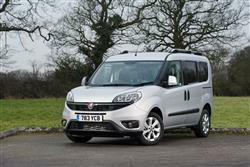 Find out everything you need to know on the new Fiat Doblo from independent vehicle review website Car And Driving. You can watch the video review to the left to see more of the car or read their written review below to get a true insight from an expert in the automotive industry. Collectively, the assembled protagonists in the van-based MPV sector might do little to stir the emotions or fire the imagination but few vehicles can touch them when it comes to sheer, unadulterated practicality. This is certainly true of Fiat's Doblo - a van with a mission, to seat up to seven and still have space left over. June Neary investigates. Fiat are calling out to all family buyers on a budget with their Doblo MPV. Admittedly, the vehicle is suited more to those with a large family and a small budget than vica versa, but you get the general idea of the people to whom this spruced-up commercial vehicle will appeal. Anyone with designs on luxury and head-turning looks can probably afford to look away now, but those in the hunt for a well-appointed, spacious, 5 or 7-seater with a suitably small sticker price might want to pay closer attention. The Fiat Doblo's battle for supremacy in the van-based MPV market sees it principally drawing swords against the three musketeers - the van-based MPV offerings from French manufacturers Renault, Citroen and Peugeot. These are known as the Kangoo, Berlingo Multispace and Partner Tepee respectively. As is right and proper, the versatile Italian has style on its side. Although all four combatants look, for the most part, like vans. At least the Doblo shares its visual characteristics with the Doblo Cargo - arguably the most strikingly sculpted vehicle in the hi-cube van sector and all the better for a recent facelift. Today's Doblo has an almost 4x4-like look to it. A chunky grille, bigger headlamps and wider underbumper intakes add a little extra presence. The styling is more distinctive than handsome but this is still a sizable feather in the Doblo's cap, especially considering the rather bland, 'commercial-vehicle-with-windows', looks of the Gallic contingent. If you want to own a van-based MPV while retaining even a modicum of street-cred, the Doblo is the only vehicle worth attempting it in. Does the Fiat Doblo suit me? It's a question that could easily be taken the wrong way. Nobody, after all, really wants to be shoehorned into this particular niche market. It's just something that happens through a combination of budget constraints and practical necessity. "Does this Range Rover fit in with your lifestyle?" "Why yes, I think we're a prefect match." "Do you feel at home in this Ferrari 612 Scaglietti?" "Of course, it's like I've found my motoring soul mate." Does this Fiat Doblo suit you?" "Are you taking the Mickey?!". It might not be much of a fashion statement but it'll get you, your family and a mountain of luggage, safely and cheaply from A to B. In the midst of their marketing spiel, Fiat proudly proclaim that the Doblo can accommodate five mountain bikes and their riders within its generous interior. Actually accomplishing this kind of feat may be a trifle ambitious, but you get the idea of the multi-person, multi-purpose usage for which the vehicle was designed. Practical it most certainly is. The seating arrangement is a two in the front, three in the back affair and there's plenty of versatility built-in to accommodate numerous passenger/luggage combinations. All the seats are firm, comfortable and covered with a hardwearing cloth that should stand up well to the rigours of everyday use. The driving position has no fewer than five possible adjustments, so you can manoeuvre the seat into the position that fits you best, and the back bench is equally pliable. With the rear seats in place, the Doblo has a huge luggage area which would dwarf that of any standard family hatchback. The seats can also be split 60/40 to create additional storage capacity - 3,000 litres are available with everything fully folded away. Accessing all this room inside the Doblo couldn't be easier. You get two sliding side doors at the rear, in addition to the usual access points at the front. You'll need quite some space at the back of the Doblo to get the tailgate open, so it's better to drive nose-first into supermarket parking spaces and the like but even if you do get boxed in, the sliding side doors can be utilised. If you want to transport seven people, there's even a 'Family' version with two extra seats in the rear. The Fiat Multijet diesel engines are a perfect fit in a vehicle of the Doblo's ilk and it's these that form the mainstay of the range. The weedy petrol and diesel engines that saw the previous generation Doblo's 0-60mph times extend up towards the 20s barrier have been axed. Now there are 105bhp 1.6-litre and 135bhp 2.0-litre Multijet diesel units as well as an entry-level 1.4-litre 16-valve petrol with 95bhp. No Doblo is what you would call quick but performance promises to be energetic enough for the kind of use to which the car will be put and the diesel engines should have the muscle to cope with the big payloads that the car is likely to be tasked with. The petrol unit takes 15.4s to reach 62mph from a standing start and with the 1.6 diesel managing a 13.4s time and the strong 2.0-litre taking 11.3s. More relevant is the torque that's available and 320Nm from 1,500rpm underlines the strength of the range-topping unit. Also having a major impact on how the Doblo drives will be its surprisingly advanced suspension system. Unlike other van-based MPVs and the majority of models in the wider small car market, the Fiat has independent suspension at the rear as well as the front. It's a feature normally reserved for far more expensive vehicles and promises to bring a greater level of finesse to the Doblo's handling. Pricing sits in the £12,500-£17,500 bracket, so it's not that cheap, but when you look at how much it's capable of, the Doblo is a good value buy. The Fiat Doblo appears to do everything it sets out to do. It can carry impressive amounts of people and things, it's inexpensive to buy and to run. What's even better is that Fiat have managed to throw in a thoughtfully designed interior, a reasonable driving experience and still the most eye-catching looks in the van-based MPV sector (even though the competition is less than fierce). If you need five or seven seats and a big load bay on a budget, the Doblo is a sensible choice.